Click Here for our full coverage of the 2015 SummerWorks Festival. This interactive event is really two pieces tied together by your cell phone. The first, “Tethered Together” is a celebration of communication and intimacy as participants are guided into an anonymous confessional conversation with another audience member via text message. It’s not revolutionary (the questions include such unimaginative gems as “if you could have dinner with any person on earth, whom would you choose?”), but it’s an interesting experience that reveals, if not a lot, at least a little about you. I’m too self-reflective to be surprised by any of my answers and the questions were too safe to really test my willingness to tell the truth (a low threshold that wasn’t even approached), but I found myself at the end of four questions feeling like I knew the person at the other end of my conversation and I was intrigued to find myself very preoccupied with uncovering the identity of my texting partner. I ended up suspecting the wrong person (I found out their identity after the show but, don’t worry, most people remain completely anonymous) but I came pretty close, using the tone and content of the texts I received to narrow my search to just young women with an artsy but not-too-rebellious style. The amount that I was able to deduce about who this person is from a few quick texts is pretty remarkable and really, I think, says something about how much of ourselves we put into how we say what we say. The second piece, “I Wish I Was Lonely”, is less of an experiment and more of an actual theatre piece. It’s notably un-theatrical- the performers (Alex McCooeye and Nicola Elbro) go by their own names and interact with the audience organically like the fellow humans that we are, sitting in a room with no stage and all of the lights on. At one point in the show, McCooeye called my cell phone and we talked about both having unisex names (supposedly he comes up with a different piece of inconsequential small talk at each performance, depending on whose phone number he randomly chooses from the cue cards the audience hands him at the beginning of the show). But, unlike “Tethered Together”, there’s a real performance aspect to “I Wish I Was Lonely” with McCooeye and Elbro shifting between disarming naturalism (as some form of “themselves” when interacting with the audience), stylized thematic moments (the recitation of a hyperbolic cell phone contract, for instance) and poignant performance as lovers distanced by the phones that will never let them truly miss each other (after a thoughtfully uncomfortable phone scene played into microphones while facing separate corners of the room, there is something incredibly moving about the way Elbro smiles up at McCooeye when they finally connect at a hypothetical coffee shop in a technology-free real life). This second piece ends with an awkward “stare for 2 minutes into the eyes of a stranger then make a date to meet up in the future” bit that falls pretty flat, poking holes in the play’s central argument as I felt far more connected to my texting partner from the earlier piece over this person I was forced to stare silently at while trying to come up with something to say about him in case I was quizzed (I decided on “I like the way his green shirt complements his eyes”). And my trust issues had already been pushed to the max at this point, extreme audience participation, mild self-revelation, and the distribution of my cell phone number having already been obtained by a combination of peer pressure and performers I felt comfortable with (the casting here is key, anyone less endearing than McCooeye and Elbro and all sorts of walls would go up that would destroy the play’s effect). That last step is one too far but, in all other regards, the insightful juxtaposition of “Tethered Together” and “I Wish I Was Lonely” really works as both a social experiment and a piece of theatre. 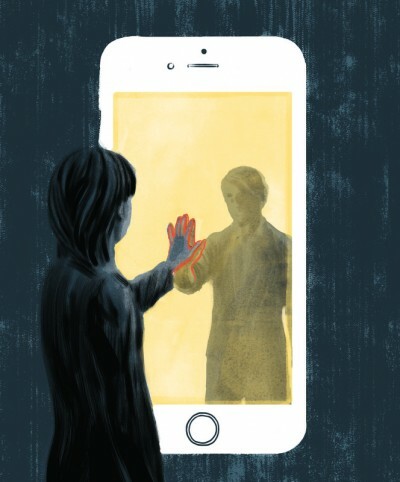 By examining the issue from both sides and making actual use of the technology in question, That Syncing Feeling manages to take one of my biggest pet peeves from the Fringe Festival (the theme of “put down your cellphone!”) and turn it into a SummerWorks triumph.